Pence was responding to pressure from conservative religious freedom advocates and politicians. Last October, Nina Shea—a religious freedom expert at the Hudson Institute—wrote an op-ed about the continued suffering of Iraq’s religious minorities, who endured brutal treatment under ISIL. She argued that the UN is not adequately serving religious minorities, and called on the United States to direct aid specifically to these groups, bypassing the UN if needed. Shea was later joined by Chris Smith, a Republican Congressman, who echoed these arguments. There are some political concerns about these moves. They occur alongside broader cuts to US aid efforts, which could limit the resources available to help Iraqi Christians. Combined with other Trump Administration policies—like the travel ban targeting Muslims—it gives the impression the United States is favoring Christians at the expense of other groups. And Pence has interfered with USAID operations, removing a long-time civil servant who oversaw the Middle East and replacing her with a political appointee. But there are also reasons to think that this approach to US aid won’t actually help Iraqi Christians. In fact, it may actually lead to more instability in the Middle East, only making things worse for Iraqi Christians. First, I completely agree with Shea and others that the United States needs to protect Iraqi Christians and other repressed religious minorities. I tracked abuses by groups like ISIL for years when I worked at the Pew Research Center, and I know how serious this situation is. And as I discussed in a report I wrote for the Center for American Progress (CAP) earlier this year, religious minorities can contribute greatly to societies by boosting economic growth and helping to bridge divides among larger ethnoreligious groups. But providing aid specifically to Iraqi Christians is not the right approach. 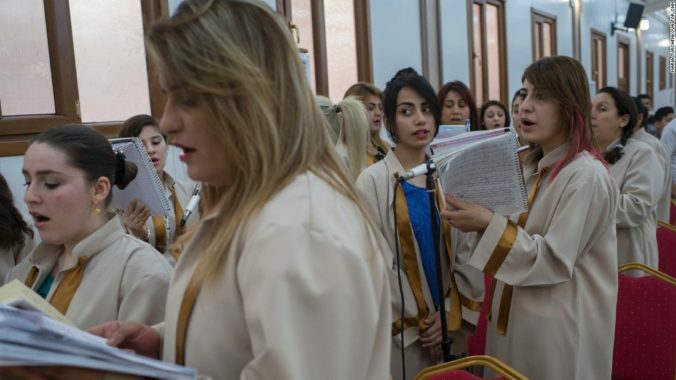 Iraq’s Christians were mistreated before ISIL, and they will be mistreated again unless we can promote a stable, nonsectarian identity in the country. Singling out one group for assistance is not the best way to do that. As I discussed in the report, and other studies by CAP have noted, a “needs-based” approach to aid, covering all of Iraq, will avoid any sign of favoritism. And as Christians and Yazidis are clearly suffering, such efforts should prioritize them. It is possible that bureaucratic issues with the UN and corruption in Iraq’s government may prevent these groups from receiving the help they need. But that means we should work more closely with the UN to improve its effectiveness, not cut it off. Aid intended for all of Iraq can promote a stable, prosperous country that will provide a home for religious minorities. By contrast, directing aid specifically towards religious minorities may only harden divisions. Some have warned against US religious engagement policies. They argue that viewing political struggles through a religious lens can solidify sectarian divisions. I wouldn’t necessarily go that far. Religious minorities have been repressed throughout the 20th century, well before America incorporated religious engagement into its foreign policy. But it is true that the way we approach religious issues can alter the facts on the ground. If the United States singles out Iraqi Christians for help, this may intensify other groups’ hostility towards them and even suggest they are more loyal to America than Iraq. These new policies may ensure religious minorities receive necessary support. But these groups may also attract more governmental discrimination and extremist violence, leaving them less secure. Greater sectarian tensions in Iraq could spark a new wave of fighting, further destabilizing the region. This, in turn, may lead to even more persecution of religious minorities; in a recent study, Jason Klocek (of Notre Dame’s Global Religion Research Institute) and I found that states often intensify religious repression after sectarian conflict to keep religious communities under control. Again, I fully agree with what these policies hope to accomplish. Christians and Yazidis in Iraq have suffered greatly, and need our help. But favoring these groups with aid distribution may only exacerbate tensions among religious communities. It could even lay the foundation for future conflict. A broad-based aid program in cooperation with the United Nations does not ignore the suffering of Iraq’s Christians. In fact, it may be the only way to ensure they can be safe.